Do you ever get out of class and experience an intense sugar craving? Chances are it’s because your body is dehydrated. When we exercise our bodies tell us we need water and nutrients in the form of sugar and salt cravings. Step one-refill your water bottle pronto. Step two- if you still have your sweet craving, satisfy it with natural sweeteners. When its hot out, I’m sometimes guilty of grabbing a scoop of sugary, artificially flavored ice cream. As an alternative, make this simple, homemade sorbet recipe and experiment with a combination of different fruits and natural sweeteners. Here is a basic recipe. Feel free to mix up the flavors with different types of fruits to see what best satisfies your sweet tooth. In a small saucepan bring water and agave to a boil, stirring frequently to mix well. Remove from burner and allow to cool. Once mixture is cool, stir in lemon juice and orange juice. Pour into a bowl and freeze for 2 hours. After 2 hours, transfer to a blender or food processor and process until smooth. Place back into the bowl in the freezer until completely frozen. Do you get strong sugar cravings? If so, what are your favorite healthy snacks to satisfy your sweet tooth? Dried fruit, dates, apples… fruit! 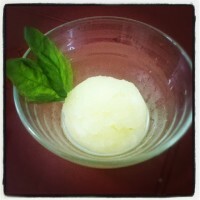 Making a sorbet on a hot day just to satisfy my sugar cravings isn’t a bad at all! Nevertheless, I’ll try to experiment with other fruit juices. Thanks for sharing! Hi! Can I do this with honey instead of agave?